Register the fish you caught at any of our June Lake Loop lakes and streams, and you will be eligible. 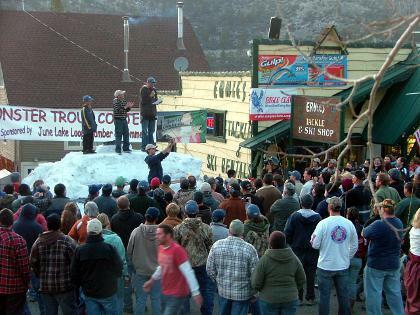 Gather in front of Ernie's Tackle and Ski Shop on the evening of April 27 to participate in the awards and festivities. All of our Lodging, Shopping, Dining and other recreational facilities will be open and waiting to serve you for the 2013 season. In addition to fishing there are many other activities available in the Loop, including hiking, climbing, boating, cycling, photography, and more. June Lake is centrally situated in the Sierra and it's an ideal base location for visiting many nearby attractions such as Mono Lake, Bodie Historic State Park, the Mammoth Lakes area, and Yosemite.